Maintaining the momentum of positive growth among all the brands, ZENITH with more popularity announces the inclusion of another product to our portfolio. After a great successful story of Samurai CTC machine, Zenith announces the new highly engineered dynamic version of the CTC machines as "Z-Cut" with the confidence that the same will be received & appreciated by our valued customers as enthusiastically as before. Zenith belief that growth and expansion are hinged upon by giving the customers a hassle free product along with after sales service. Graded vertically casting used for pedestals dully reenforced for higher rigidity & construction for vibration free performance. Interchangeability of rollers H.S. to S.S. or vice versa and similarly from one cut to another cut interchangeability of parts made possible. Changing of Rollers easy & fast. Positive Drive Grear Box is fitted with hardened shafts, gears and heavy duty bearing for longer life and drive heavy Duty Propeller Shafts. Based on experience that 40" wide conveyor belts, Full cutting area of 36" wide rollers can not be used and allows side spillage, viewing this handicap 42" wider imported PVC non-sticky conveyor belts are provided. 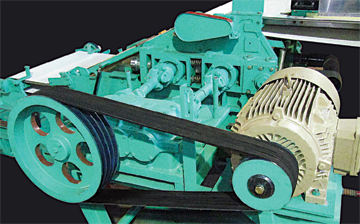 Belts are hygienically safe and have long life. 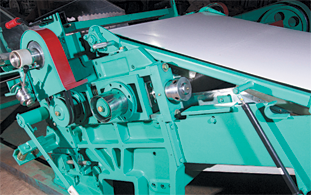 Unlike static covers where cut mal deposits on the covers and thus becomes the mother bed of bacteria, the moving covers with imported PVC belts, does not allow any deposition or accumulation of teas. No lump or Ball formation. S.S.angularly & specially designed side guards. Enhanced the hygienic values by not allowing accumulation of teas in any inaccessible area and thus bacterial menace eliminated. 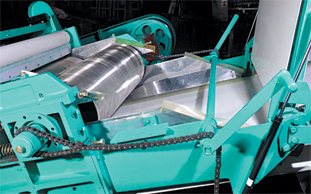 The specially designed side guards, winder conveyor belt, have made to achieve virtually nil spillage. Cooling fan with pipe line connecting to each cut is provide from behind the rollers prevents leaf temperature from rising, thereby increasing the quality of liquor. System saves damage to roller. Achieves same matching / Meshing. 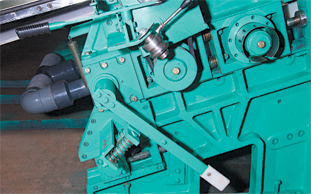 Hardened and ground bearing sleeves are provided on the mandrel bearing journals to ensure minimum damage to bearings. Unique roller removing system make removal system make convenient and easier. Simple & operator friendly clutch system introduced for engaging and disengaging moving of conveyor belts within fraction of a second.